Yes, it is finally time to retire whatever shoes have been keeping your feet captive for the past six months. Whether it’s your trusty white sneakers, combat boots, or rain boots, we can officially put them to one side. So hit up your local nail salon and treat yourself to a pedicure because it’s time to get some sun on our toes. The Spring/Summer 2018 runways were filled with sandals, from ankle strap flats to knee-high gladiators. We loved the kitten-heeled ankle wrapped sandals we saw on the runway at the Tibi show. Light colored pastels made these sandals look for perfect and fresh, just in time for the warmer months. Altuzarra channeled historic Greece with its gladiator style sandals. From ankle-high flats to knee-high heels, these sandals definitely commanded attention. Dolce and Gabbana didn’t skimp on glamor anywhere during its show either, and certainly not on the footwear. Not a square inch was missed when it came to embellishments on its gladiator-style sandals. If you’re not blessed with warm weather year round, you’ve probably been itching to put on a pair of sandals now the sunny season has finally arrived. But with so many styles and variations, it can perhaps be a little overwhelming. We’ve narrowed it down to our three favorite styles of sandals to rock in the summer months: slides, ankle strap sandals, and gladiators. 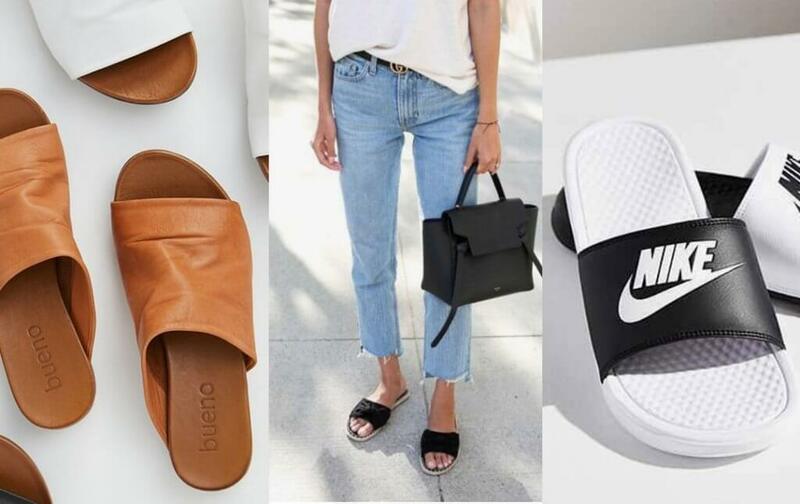 Slides have seen a huge resurgence since last year and the popularity of athleisure, and we aren’t mad. Ultra comfortable, these sandals are an effortless addition to any outfit. Whether you pair them with a cute summer dress, throw them on with your workout gear, or slip them on poolside, they are guaranteed to keep you looking stylish while remaining comfortable. These were a popular style on the runways this year. Whether you opt for a flat pair or dial it up a bit with a heel, ankle strap sandals are most certainly a hot shoe. The only downside to this variety is that they aren’t the easiest style to slip on and off. We’d refrain from wearing them if you’re likely to take a dip in the pool or ocean at any moment – they’re not exactly easy to kick off! Our favorite strappy sandals right now are by Amanu Studio. Sustainably sourced and made, classic, and fully customizable, we’re forever waiting on the occasion to strap a pair of these on. There is something about the gladiator sandal that keeps them from ever going out of style. Seriously! The ancient Greeks probably didn’t know that they would start such a trend. These sandals are the perfect shoe to take a day look into the night. Super stylish with jean shorts and a tee, they are equally as great with a cocktail dress. We love their versatility. The summer months are *officially* here, so don’t wait for a second longer to break out those sandals. Our feet deserve a little fun in the sun after all we put them through!